Welcome to the club, hope you enjoy it as much as I do. You might have a hard time finding a 158 grain JHP in 357 mag that expands reliably. They seem intended for hunting. However, Buffalo Bore has an awesome 38 special 158 grain lswc soft hollow point that should do around 1000-1100 fps in you gun. It is essentially a 38/44 load for the modern age. The 180 gr. Buffalo bore stuff is supposed to be awesome as well, large flat nose on those puppy’s. Hell of a round out of a carbine as well…..think Mod. 92…..cowboy assualt rifle. 20″ barrel, ghost rings, ye-haw. And Ruger just brought out a new Redhawk, .45ACP —.45 LC, 5″ barrel. Just double checked. 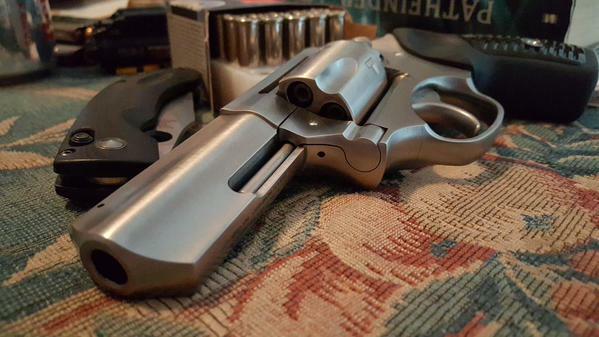 4.2″ barrel, and round-butted. .45 Colt rounds, or A.C.P’s in moon clips. Also, see you got the longer barrel on the 101, instead of the snubby. Thoughts? I owned the 101’s daddy once, a Security Six with a very slick trigger. One of the guns I regret letting get away. I really like Ruger’s cylinder release. Much easier to open than S&W or Colt. I second the sentiment to consider 158 grain and heavier bullets in .357. I had a SAA with 6 or 6-1/2″ barrel. I used to load it hot with thin jacketed 125 grain JHP bullets. I had no chrono in those days, but a near max load of H-110 powder was probably pushing the bullets well over 1600 fps. I once shot a rabbit at about 25 yards and it just exploded. I mean nothing left but bits of fur. Such ammo would obviously provide poor penetration on larger game or for defense. If you are going to push the bullets hard at .357 Mag velocities, you need more solid construction. Either 158 or heavier JHPs or maybe Barnes TSX (called TAC or XPB, if I recall). You could go lighter with them, I suppose. I can do so with TSX rifle bullets. Welcome to the club. 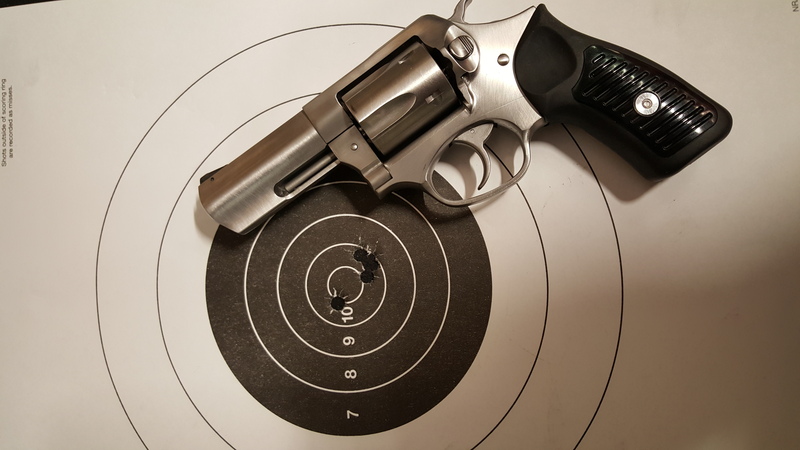 I have been well served by a Ruger Security Six 4″ HB, My SP-101 is a 4″ .22LR, the old 6 shot model. I like the 125 gr .357s or the old 145 gr Silver tips back in the day. If I want heavy bullets a Super Blackhawk 7 1/2 inch with 240 gr bullets will serve, now how can I carry it concealed in Florida to deal with the Black Bear assault problem? My Father-in-Law gave my a snubby 101 as a b-day gift a few years ago. Just love it. Only gripe for me is I need to soften the edges of the trigger itself. With full power factory ammo it gets irritating after a couple boxes. Had one, liked it. I carried the buffalo bore 158 gr loads. Built tough, but heavy for a five shot. If it were 6 in the same size, I would buy another. I carried one of those for YEARS. It was my sole handgun for quite some time – don’t ask. I even shot the crane loose, (I don’t care if anyone believes it – Ruger did and sent me a new gun) at one point. That is not a slam on the gun – it was subjected to a multi year endurance test. They are great guns. Look cool, too.